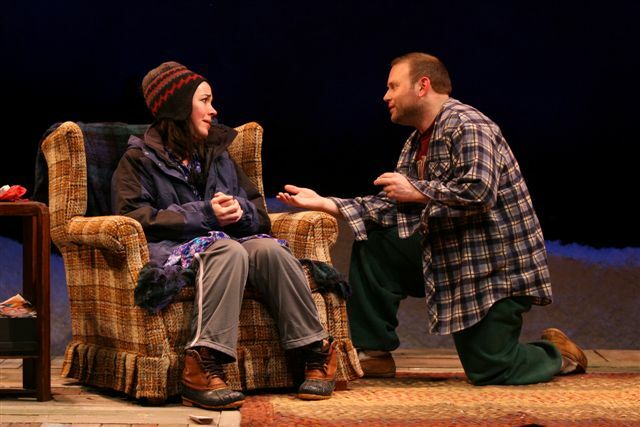 So I went and saw the play “Almost, Maine” yesterday with my friend Darcy; it is a series of sketches in a small town in Maine in the middle of winter, all of which deal with relationships of one type or another. It started a little slow but was pretty good the rest of the way through; I’d suggest you go see it, but yesterday was the last show! One great sketch was a girl who shows up at her long time (eleven year) boyfriend’s house in the middle of the night needing to end the relationship because it is not going anywhere. She wanted back “all the love she had given him”, and she had “all the love he had given her” out in the car to return to him. She went and got it from the car, which consisted of a HUGE pile of huge brightly colored bags that looked like laundry bags. When she asked for “her love” back from him, it was a tiny little pouch the size of an apple. She was surprised it was so small, and then after a lot of interesting discussion about love and relationships, he explained that he had taken all the love she had given him (which actually a lot) and put it into this very tiny package. Which turned out to be a ring. ← Someone UNdented my car!